"The IV Sedation Course at Duquesne University is a truly great course. It is extremely comprehensive in nature and not for those who aren't serious about learning. The course work is intense, training is demanding, and the instructors are second to none. The learning materials are of high quality and up-to-date and the clinical training builds confidence.. I highly recommend this course to anyone looking to add IV Sedation to their treatment repertoire." "I would recommend the Duquesne University IV Sedation Program to any office interested in offering conscious sedation. The convenient course dates, the professional and knowledgeable teaching staff, the excellent clinical training and the beauty of the great city of Pittsburgh make this course a winner." "I want to thank you again for the excellent IV sedation course. I am totally comfortable using the safe protocol I learned. I especially appreciate the portion of the course where I was able to start IVs and learn from anesthesiologists on the job at the surgical center. It's a wonderful benefit to my patients to be sedated for surgical procedures or extensive treatment plans. The cost for the course was recovered in less than a year." 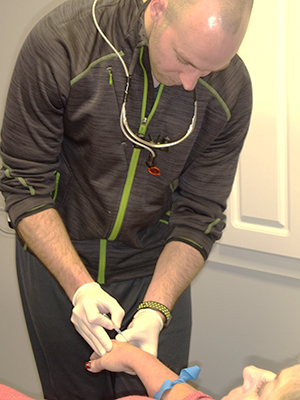 "Dr. Mermigas' Course changed the way I practice dentistry. IV sedation has allowed me to provide quality dental care to patients who would have never sought treatment in another environment. I highly recommend taking all of these courses - it will raise your practice and patient care to the next level."